Are You Having a Good Time?!?! After a notable two-year absence from the new-release racks, The Lucksmiths return with a mighty "don't argue" in the shape of 'Spring a Leak', their exhaustive new collection of lost treasures. No mere greatest hits collection, 'Spring a Leak' compiles over a decade's worth of great recordings that have never made it onto a Lucksmiths full-length: b-sides, alternative versions (from 7" singles and demos), songs recorded especially for compilations, live, radio and TV sessions, cover versions, remixes, and various previously unreleased ephemera. Forty-five songs in all, packaged in a deluxe double-CD digipak with cover artwork by budding Melbourne illustrator Trudy White. 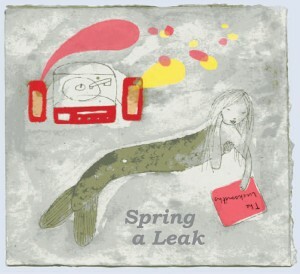 A major undertaking, both for the band and the mastering engineer who had to sift through piles of CDs, old DATs and cassette tapes, 'Spring a Leak' is the first time many of these songs have turned up on a digital format. The 'Macintyre' 7" (recorded in 1995 and originally limited to 500 highly sought-after copies) sits comfortably amongst more recent work including cover versions of well-loved songs by The Bee Gees, The Smiths, The Modern Lovers, and The Magnetic Fields, as well as lesser-known tracks by some of The Lucksmiths' friends such as The Simpletons, The Ladybug Transistor, and The Sugargliders (cousins, incidentally, of Lucksmiths singer Tali White). Also included are live tracks and radio sessions recorded in various corners of the world, from Melbourne to Stockholm, Paris, Bellingham, the Los Altos Hills (near San Francisco), and El Dorado (near, um, Wangaratta). As ever, The Lucksmiths' somewhat minimalist sound is broadened by a host of guests, from groups like US indiepop stars The Aislers Set, Poundsign, Kissing Book, The Mosquitoes, and Still Flyin', as well as artists closer to home such as Craig Pilkington of the Killjoys (who recorded many of these tracks at his Audrey Studios), Pete Cohen of Sodastream, Kellie Sutherland of Architecture in Helsinki, and Darren Hanlon. Both Kellie and Darren played major roles on The Lucksmiths' acclaimed 2000 album 'Why That Doesn't Surprise Me'. As on previous compilations 'Happy Secret' (1998) and 'Where Were We?' (2001), The Lucksmiths have done some tidying up around the archival recesses — a little spring cleaning, if you will — and gathered these loose ends into one neatly-knotted bundle more likely to satisfy the completists than to win themselves an army of new fans. By the nitpickingly precious Lucksmiths' own admission, the bar was lowered just a little on this one (although a few tracks originally slated for inclusion were eventually deemed unlistenable, and consequently omitted): there's the odd bum note, and, inevitably, given the nature of the project, varying degrees of quality across the recordings. In its entirety, however, 'Spring a Leak' exhibits both the remarkable consistency and ongoing development of one of this generation's most esteemed and distinctive pop groups. Although occasionally misunderstood and underrated in their homeland of Australia, The Lucksmiths have in the course of their 14-year career amassed a devoted international fanbase as well as some deserved praise from certain corners of the media. Of their 2005 album 'Warmer Corners', Pitchfork Media described The Lucksmiths as "idiosyncratic but accessible, literate but unpretentious, gentle but not weak, sincere not so much in presentation (cf. Springsteen, Bruce; Confessional, Dashboard) as in presence (cf. Richman, Jonathan; Comedy, Divine)".